Set a rack on the upper third of the oven and preheat to 450 degrees Fahrenheit. Place the potatoes in 9”x13” baking dish. Toss with 3 tablespoons of the olive oil and a teaspoon of the salt. Roast for 1 hour and 10 minutes. In a small bowl, combine the remaining 2 tablespoons olive oil with the garlic, jalapeño, and the remaining ¼ teaspoon salt, mix well. After 1 hour and 10 minutes, remove potatoes them from the oven and toss with the jalapeño mix, scraping the bottom of the baking dish as you do. Mix well and place back in the oven for another 35 to 40 minutes, flipping and scraping once in between, until completely crisped up. Serve. Another awesome recipe, thank you Pati. I made these for a non-garlic lover and used shallots, which was delicious. 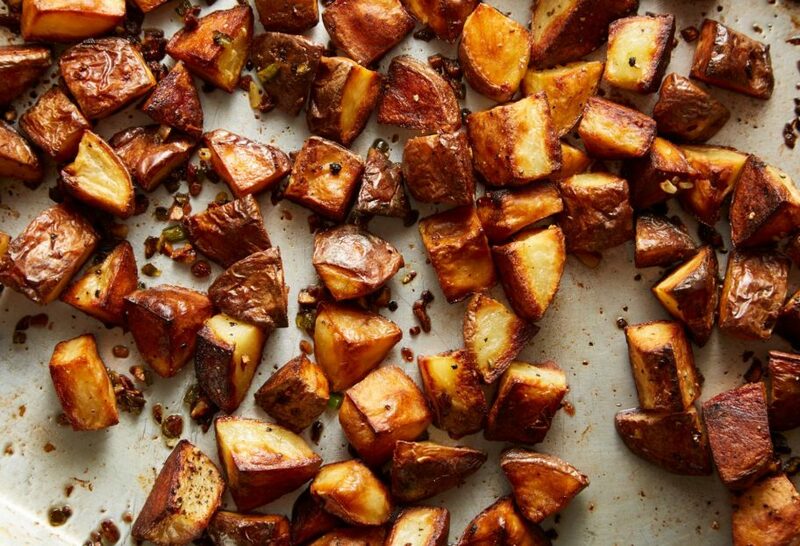 I used to add onions and peppers to roast potatoes from the start and they burned. It was great adding them later. I cut my potatoes very small, so they ended up cooking in much less time. I’m so glad everyone liked them…and that my tips helped you out, Karen.